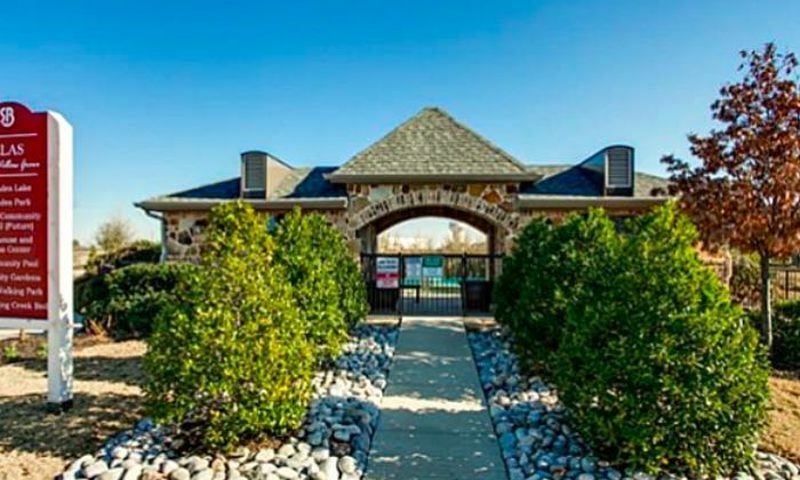 Villas at Willow Grove is an active lifestyle community located in McKinney, Texas. Developed by Grenadier Homes, Villas at Willow Grove offers low-maintenance homeownership with single-story living and amenities to keep residents physically fit and socially active. Set amongst the pleasant climate in the Dallas-Fort Worth area, Villas at Willow Grove provides everything that homebuyers would ever need to spend their days as they please. Homeowners regularly meet in the community clubhouse. Indoors, residents can stay in shape in the exercise room or join a game or event in the multi-purpose room. Villas at Willow Grove has terrific amenities scattered across the community's grounds. Homeowners can gather around the pool, patio, or the picnic and BBQ areas. Walking and biking trails weave throughout the community for getting some fresh air, while a dog park is perfect for giving your four-legged friend some exercise. A community garden and a scenic pond create a beautiful backdrop for early morning walks. Grenadier Homes began construction on Villas at Willow Grove in 2010 and the community has 157 homes. These homes range in size from 1,259 to 1,691 square feet and offer two or three bedrooms, two bathrooms, and an attached two-car garage. These ranch-style homes also have private outdoor spaces, granite countertops, open floor plans, and dramatically tall ceilings that allow plentiful sunlight. Homeowners can also enjoy a more relaxed lifestyle thanks to the monthly homeowners' association fee that covers lawn mowing, weeding, fertilizing, edging, and watering, giving residents more time to pursue their interests without worrying about tedious lawn chores. Living within Villas at Willow Grove means keeping a full calendar. Homeowners can join the book club or enjoy a friendly game of bridge or bunco. Socializing is easy with holiday parties, men's coffee, and potlucks. Explore the surrounding area with bus trips or enjoy a refreshing swim with friends on a warm day. Celebrate the new season with a spring celebration or go visit the farmers' market with neighbors. Villas at Willow Grove will make sure you're never lacking in something to do. Villas at Willow Grove is located in the highly desirable city of McKinney, Texas. McKinney was voted as the "Best Place to Live in the United States" by CNN Money in 2014. Villas at Willow Grove is conveniently located across the street from Gabe Nesbitt Community Park and Methodist McKinney Hospital. For everyday needs, residents have a Kroger, Home Depot, and Walmart just a short drive away. For cross-state travel, the Sam Rayburn Tollway is close by and, for farther travel, the Dallas/Fort Worth International Airport. McKinney offers a variety of shops, restaurants, and attractions to keep homeowners busy year round. Main street has boutique shops, restaurants, and even a winery housed in classic western architecture. Outdoor enthusiasts will love the wildlife sanctuary, Towne Lake Recreation area, and Erwin Park Hike and Bike Trail. McKinney has an abundance of museums, pubs, art galleries, and over a dozen golf courses. Villas at Willow Grove combines the best in low-maintenance living with the beautiful city of McKinney, Texas. There are plenty of activities available in Villas at Willow Grove. Here is a sample of some of the clubs, activities and classes offered here. These homes range in size from 1,259 to 1,691 square feet and offer two or three bedrooms, two bathrooms, and an attached two-car garage. These ranch-style homes also have private outdoor spaces, granite countertops, open floor plans, and dramatically tall ceilings that allow plentiful sunlight. This is a wonderful community, but it is not an age restricted community. Great for single professionals and others who like privacy, security, and great neighbors. 55places.com is not affiliated with the developer(s) or homeowners association of Villas at Willow Grove. The information you submit is distributed to a 55places.com Partner Agent, who is a licensed real estate agent. The information regarding Villas at Willow Grove has not been verified or approved by the developer or homeowners association. Please verify all information prior to purchasing. 55places.com is not responsible for any errors regarding the information displayed on this website.